EUGENE, Oregon – Who is ready for the 2018 NCAA Division I Outdoor Track & Field Championships? 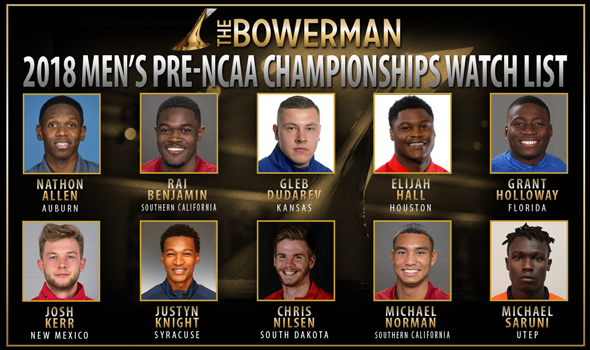 We can tell you without a shadow of a doubt that all 10 members of the Men’s Pre-NCAA Outdoor Championships Watch List for The Bowerman are champing at the bit to get going at Historic Hayward Field in Eugene, Oregon. Rai Benjamin JR Southern California Sprints/Hurdles Mount Vernon, N.Y.
Grant Holloway SO Florida Hurdles/Jumps Chesapeake, Va.
Chris Nilsen SO South Dakota Pole Vault Kansas City, Mo. Michael Norman SO Southern California Sprints Murrieta, Calif. There weren’t any changes between the previous iteration of the Watch List for collegiate track & field’s highest honor and now. Each of the 10 men who were on it before the NCAA Preliminary Rounds returned to the prestigious index after it concluded: Auburn’s Nathon Allen, Southern California’s Rai Benjamin, Kansas’ Gleb Dudarev, Houston’s Elijah Hall, Florida’s Grant Holloway, New Mexico’s Josh Kerr, Syracuse’s Justyn Knight, South Dakota’s Chris Nilsen, Southern California’s Michael Norman and UTEP’s Michael Saruni. Allen was the second quickest qualifier out of the East in the 400. He crossed the finish line in 44.76, which is the third time he went sub-45 seconds this season. Allen also ran the anchor leg of Auburn’s 4×400 relay that punched a ticket to the Emerald City. Benjamin made it look easy in the 400 hurdles and on the leadoff leg of the 4×400 relay. It was in the former, however, where Benjamin shined. Benjamin became the fourth fastest performer in NCAA history with the fourth fastest time when he ripped around the track and over the hurdles in 47.98. Dudarev qualified for the final site with a heave of 73.09m (239-9) in the hammer. He topped the rest of the field in the West by 14 feet. Hall qualified fourth out of the West in the 100 with his time of 10.22. It wouldn’t be out of the question to see him on the Cougars’ 4×100 relay team as well. Holloway competed five times across three days in Tampa, Florida. He qualified second in the 110 hurdles, ninth in the long jump and helped out on the top-qualifying 4×100 relay and the 4×400 relay that qualified third. Kerr cruises into Eugene in the 1500. The Scotland native was the top qualifier in the West with his time of 3:42.62 and was first across the line in both the preliminaries and quarterfinals. Knight punched his return ticket to Oregon with a Heat 2 victory in the 5000. He was also the second fastest qualifier in the East with his time of 14:08.56. Nilsen didn’t have to do much in Sacramento, California, as he passed on the first three bars and cleared 5.25m (17-2¼) on the first attempt. He was one of three vaulters with a clean sheet. Norman went sub-45 for the second time this season in the 400 with his top-qualifying time of 44.67 in the 400 and then turned it up a notch in the 4×400. He anchored the Trojans in 43.06, which is the second fastest 4×400 split in world history. Saruni glided into the semifinals after posting the top-qualifying time in the 800 (1:46.37). Three men were recognized by The Bowerman Watch List Committee, but didn’t receive enough votes to be on the actual Watch List: Arkansas State’s Jaylen Bacon, Georgia’s Denzel Comenentia and Kentucky’s Tim Duckworth. The 2018 NCAA Division I Outdoor Track & Field Championships will be held June 6-9 at Historic Hayward Field in Eugene, Oregon.